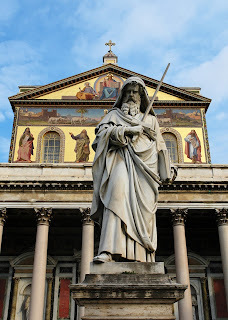 O glorious St. Paul, after persecuting the Church you became by God's grace its most zealous Apostle. To carry the knowledge of Jesus, our Divine Savior, to the uttermost parts of the earth you joyfully endured prison, scourging, stoning, and shipwreck, as well as all manner of persecutions culminating in the shedding of the last drop of your blood for our Lord Jesus Christ. 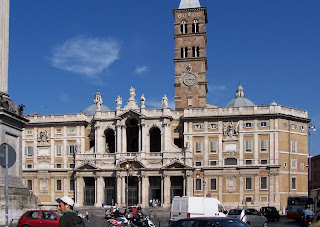 We then moved on to another Papal Basilica - St. Mary Major. PRAYER: Pardon the faults of your servants, we pray, O Lord, that we, who cannot please you by our own deeds, may be saved through the intercession of the Mother of your Son and our Lord. Who lives and reigns with you in the unity of the Holy Spirit, one God, for ever and ever. (a) It stands as a venerable monument to the Council of Ephesus (431), at which the dogma of Mary's divine Motherhood was solemnly defined; the definition of the Council occasioned a most notable increase in the veneration paid to Mary. 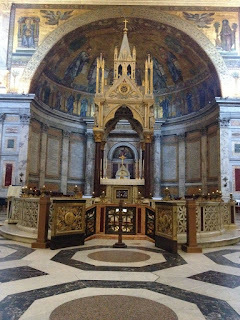 (b) The basilica is Rome's "church of the crib," a kind of Bethlehem within the Eternal City; it also is a celebrated station church, serving, for instance, as the center for Rome's liturgy for the first Mass on Christmas. In some measure every picture of Mary with the divine Child is traceable to this church. 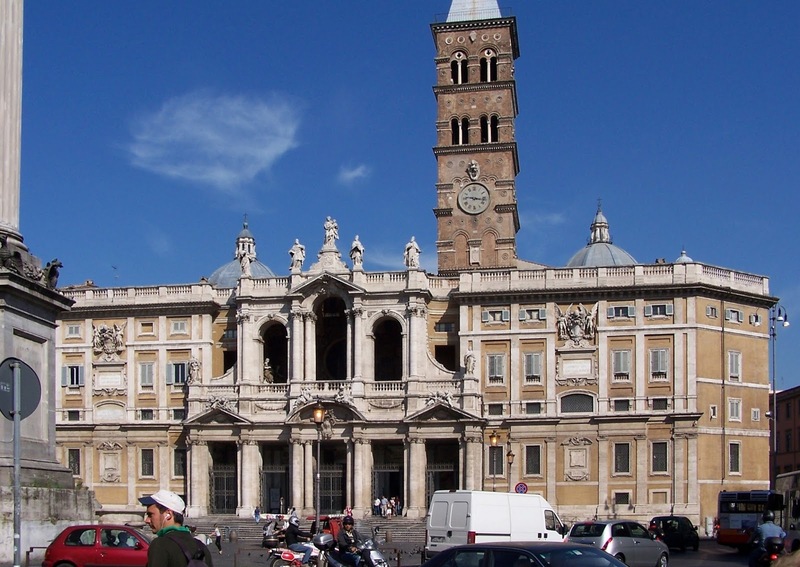 (c) St. Mary Major is Christendom's first Marian shrine for pilgrims. 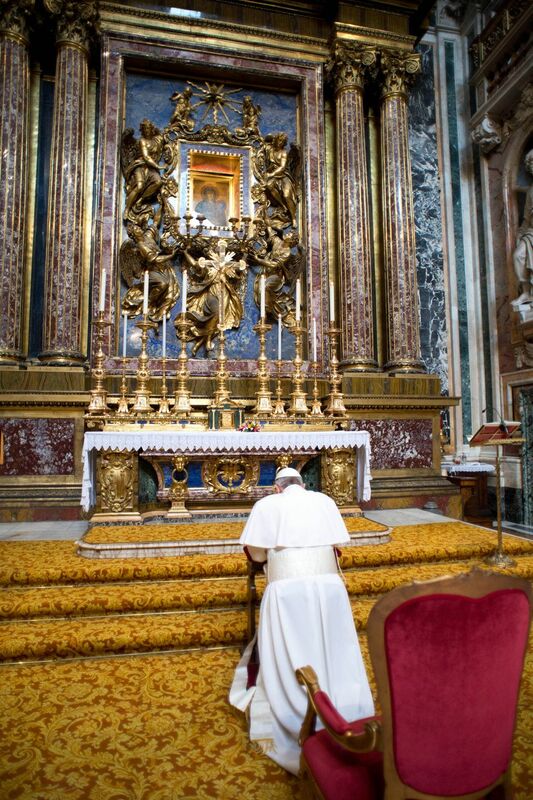 It set the precedent for the countless shrines where pilgrims gather to honor our Blessed Mother throughout the world. Here was introduced an authentic expression of popular piety that has been the source of untold blessings and graces for Christianity in the past as in the present. The beginnings of St. Mary Major date to the Constantinian period. Originally it was called the Sicinini Basilica; it was the palace of a patrician family by that name before its transformation into a church by Pope Liberius. The story of its origin is legendary, dating from the Middle Ages. 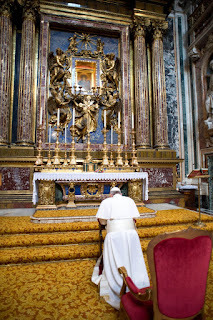 The Breviary gives this version: "Liberius was on the chair of Peter (352-366) when the Roman patrician John and his wife, who was of like nobility, vowed to bequeath their estate to the most holy Virgin and Mother of God, for they had no children to whom their property could go. The couple gave themselves to assiduous prayer, beseeching Mary to make known to them in some way what pious work they should subsidize in her honor. "Mary answered their petition and confirmed her reply by means of the following miracle. On the fifth of August — a time when it is unbearably hot in the city of Rome — a portion of the Esquiline would be covered with snow during the night. During that same night the Mother of God directed John and his wife in separate dreams to build a church to be dedicated to the Virgin Mary on the site where they would see snow lying. For it was in this manner that she wanted her inheritance to be used. "John immediately reported the whole matter to Pope Liberius, and he declared that a similar dream had come to him. Accompanied by clergy and people, Liberius proceeded on the following morning in solemn procession to the snow-covered hill and there marked off the area on which the church in Mary's honor was to be constructed." 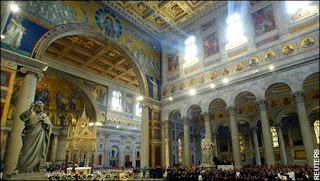 Under Pope Sixtus III (432-440) the basilica was rebuilt, and upon the occasion of the definition of Mary's divine Motherhood by the Council of Ephesus, consecrated to her honor (432). 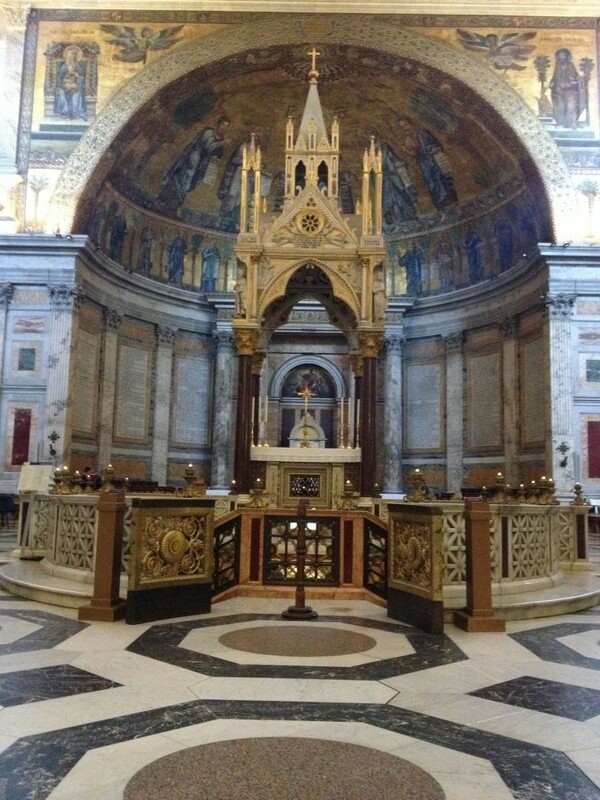 He decorated the apse and walls with mosaics from the lives of Christ and His blessed Mother, which even to this day beautify the church and belong to the oldest we possess. As early as the end of the fourth century a replica of the Bethlehem nativity grotto had been added; on this account the edifice became known as "St. Mary of the Crib." To the Christian at Rome this church is Bethlehem. Other names for the basilica are: Liberian Basilica, because it dates to the time of Pope Liberius; St. Mary Major (being the largest church in Mary's honor in Rome); Our Lady of the Snow, because of the miracle that supposedly occasioned its erection. We could point out how the divine Motherhood mystery dominates all Marian liturgy; for the Theotokos doctrine has kept Mariology Christo-centric in the Church's worship. Although recent popular devotion to Mary has become to a certain extent soft and sentimental and has, one may say, erected its own sanctuary around Mary as the center, devotion to our Blessed Mother in the liturgy has always remained oriented to Christ. In the liturgy the divine Motherhood has always been the bridge from Mary to Jesus. One need only examine Matins in honor of Mary or the Masses from her Common to be reassured. Everywhere Christ takes the central position, and Mary is the Christ-bearer. Then we went to the ancient Colosseum. Unfortunately, luggage STILL has not arrived for 5 of our pilgrims - but they've been promised... today.